December 12, 2011 - Every year around this time, I put together a real estate forecast and try to explain my expectations for the coming year. 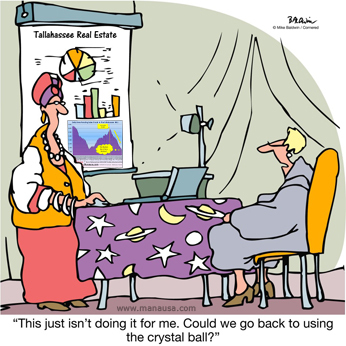 I am proud to say that I have been fairly accurate in my projections, and often times hit the nail on the head while many others in the Tallahassee housing market were calling for something entirely different. Long-time readers of the Tallahassee Real Estate Blog will recall that my real estate forecast called for falling home values and the potential for "worst year ever" for the total number of closed home sales. Currently, home values have fallen around 7% and our pace of home sales appears to be hitting the mark for the worst year ever. The most important factor involved in developing an accurate real estate forecast for 2012 is having a solid understanding of the current real estate supply and demand dynamic in Tallahassee. Right now, things appear to be getting better on the supply side, as both the real supply and relative supply of homes for sale in Tallahassee are on the decline. In the real estate graph above, the green triangles measure the number of closed home sales each month, while the red squares show the real supply of homes for sale in the Tallahassee MLS. The blue columns are the resulting measurement of relative supply (months of supply of homes measured at the current rate of demand). Both the real supply and relative supply have fallen, but they are still significantly higher than the market needs to see value trends flatten or reverse direction, thus 2012 will bring continued pricing pressure and declines in home values in Tallahassee. The shadow inventory of homes in Tallahassee is a major contributor to the present and future inventory of homes that will soon be available in the market. By definition, the shadow inventory is all those homes that need to be sold, but are not currently in the MLS (known inventory). Most national real estate reports include bank foreclosures and pre-foreclosures that are not currently listed for sale, but I like to add another category (homes that recently failed to sell but are not currently in the MLS). Once cannot produce an accurate real estate forecast without estimating the size of the shadow inventory of homes. The size of our shadow inventory is at least two years worth of supply, and most likely closer to four or more. It all will depend on the future rate of demand. 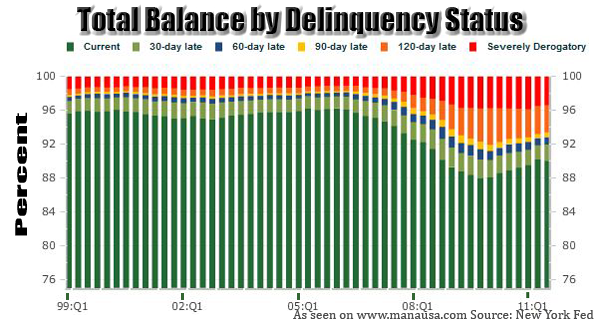 When we look at the data on mortgage delinquencies (specifically the 90+ days late category), Leon County rose +.9% from 2nd Quarter 2011 to 3rd Quarter 2011. This means that the number of people who are late 90 days or more on their mortgage is higher now than it was in June, which mirrors the changes occurring at the national level. We can conclude that there has been little or no reduction in the shadow inventory due to short sales and foreclosure sales, as mortgage delinquencies have actually risen over the past five years. Additionally, home values have declined for over 5 years now, meaning more and more people are unable to sell their home without bringing money to closing. As time moves on, the pent-up supply of homes that need to sell could very easily explode onto the market. Just as mortgage delinquencies are adding to the shadow inventory of homes, so too are the homes that have recently come off the market, having failed to sell. Currently, less than one half of the homes that hit the market in the past 365 actually sold, thus there is an abundance of homes that failed to sell over the past several years. Currently, more than 3 homes per day are joining the shadow inventory from this failed to sell group. It is important to note that this specifically measures homes that failed and did not re-enter the market, because we also track those that failed to sell and then re-entered the market. The graph above shows that the current rate of homes failing to sell (and not re-entering the market) has risen 78% since the same time last year. This could very well be a sign of many seller's "giving up" for now, and it most certainly is the primary reason why our real supply of homes has fallen. While our data is for the Tallahassee housing market only, you can be certain that this is happening in many other markets around the State and around the US, where shallowly-researched real estate forecasts are trumpeting the fall in real estate supply. While the supply side of the formula threatens to be burdensome for years to come, there are many reasons to believe the demand side will be finally gearing up to return to levels we normally see in the Tallahassee real estate market. Interest rates are at historic lows, meaning that buyers who are using credit to purchase their homes will have lower payments or more purchasing power than at any time in recent years. But as enticing as low interest rates are for homebuyers, they will have little impact on this real estate forecast. The real problem that most US housing markets have to overcome is the bulk of homebuyers who first have a home to sell. These are people who want to move (think of this as pent-up demand), but cannot sell their home and get the equity needed to buy a new one. In fact, many of these prospective buyer/seller types are upside-down in their homes and could only sell through a short-sale. If they do consummate a short sale, they will not be able to get a federally-backed home loan for the next two years. As home values continue to decline, more and more homeowners are finding themselves in this position. As I write this real estate forecast, home values are similar to levels last seen in 2003, and they are still falling. The depreciation of home values has stymied the market, and it is going to take something beyond affordability and low interest rates to get this market moving again. I believe that we will eventually see a "short sale amnesty" program launched that will allow home sellers (who remain current on mortgage payments) to do a short sale and then immediately qualify for a new government backed mortgage. This will eliminate the 2-year wait that is holding these sellers back right now and could easily be the needed priming for the pump. Remember, more than half of all homebuyers in Tallahassee traditionally have a home to sell first, so we know that fewer and fewer of them are capable of moving right now, even though they would like to move. An amnesty program for credit-worthy home sellers could turn demand around in a hurry, though I see no signs of this occurring in 2012. A positive change in our local population growth rate could be the silver bullet that helps put the real estate recovery into full gear. We can use information from the US Census Bureau to determine how our historic rate of growth has contributed to the sale of homes in Tallahassee. The Census reported that Leon County averages 2.29 people per household, and it also reported population levels every ten years going back to 1840. By combining these with mortality rates and other statistics that we track, I have assembled a model that will allow a real estate forecast for the expected path of home sales in Tallahassee over time. First of all, there is no census data for years between each decade, but several different sources place an estimate on current population levels, based upon economic activities in the area. I read a few reports that estimated our population growth had stopped (receded by less than 1%) in 2010 (when compared to 2009), so I have applied that to our known population figures from the US Census Bureau. 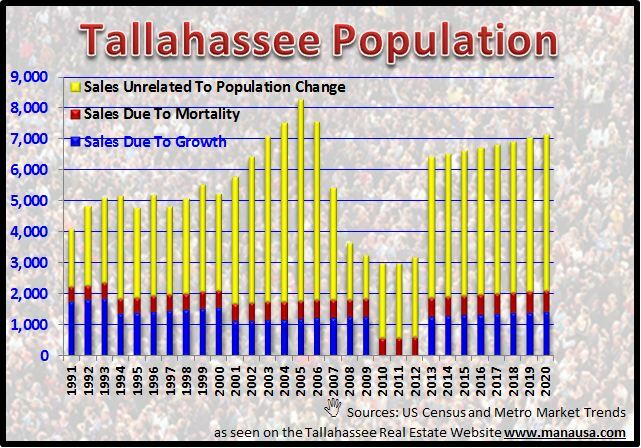 Another thing to consider is that population growth is really the net change from people moving to Tallahassee, less people moving away from Tallahassee. This is important to know, because even if there is net zero growth, there will still be an impact on home sales (but no growth will be needed in new construction). Additionally, the census reports that an average of 2.29 people live in each household in Leon County, so we can estimate the impact of population growth on housing demand with a simple formula. In this first population graph, I show historic population changes with anticipated future population changes, and its impact on home sales in a real estate forecast. For future years (below the question mark in the graph), I used the same growth rate that was recorded from 2000 to 2010. Obviously, there was a small leap taken by me at assuming zero growth for three years, then renewing at the pace we saw over the past 10 years. I am sure we could argue that growth will be faster (or slower) due to a myriad of reasons, but I feel for the sake of creating a conservative real estate forecast, this was most-expected-case based upon the information available when I wrote this article. The previous graph showed the relationship between population growth and home sales. But to do a full real estate forecast, we need to look at not only sales due to population growth, but also sales due to mortality, and of course home sales unrelated to population changes. This next graph combines all three. The yellow area shows the home sales not due to population change, and I project them recovering in 2013. This is most likely optimistic and will require some way to get short sales moving faster. But it also considers that many people have consummated short sales over the past few years and will soon be qualified to take advantage of great mortgage interest rates by the end of 2012 and then all through 2013. 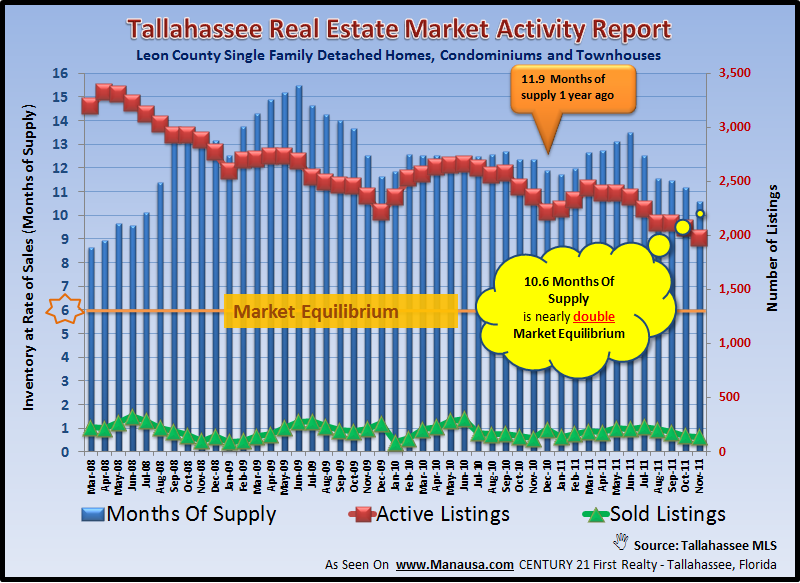 I am expecting another year of very low sales in the Tallahassee housing market. The biggest variables for next year (meaning what can make this real estate forecast terribly wrong) are population growth and home seller initiatives (like a short sale amnesty program). 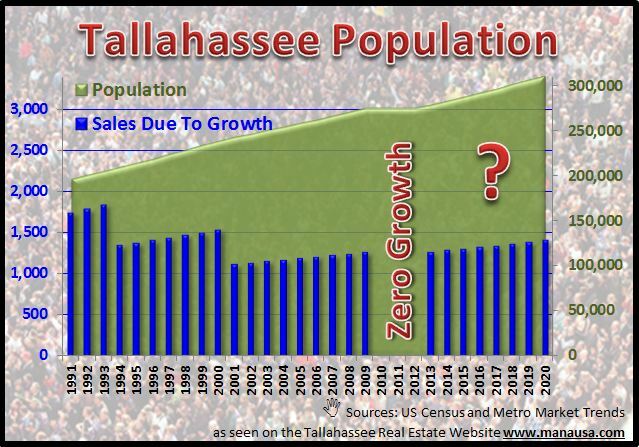 Assuming zero growth in population and the status quo on short sales, Tallahassee will record 3,200 home sales in 2012, which would only be marginally better than the past two years. As stated earlier, home values will continue to depreciate (look for another 4 to 8 percent reduction). 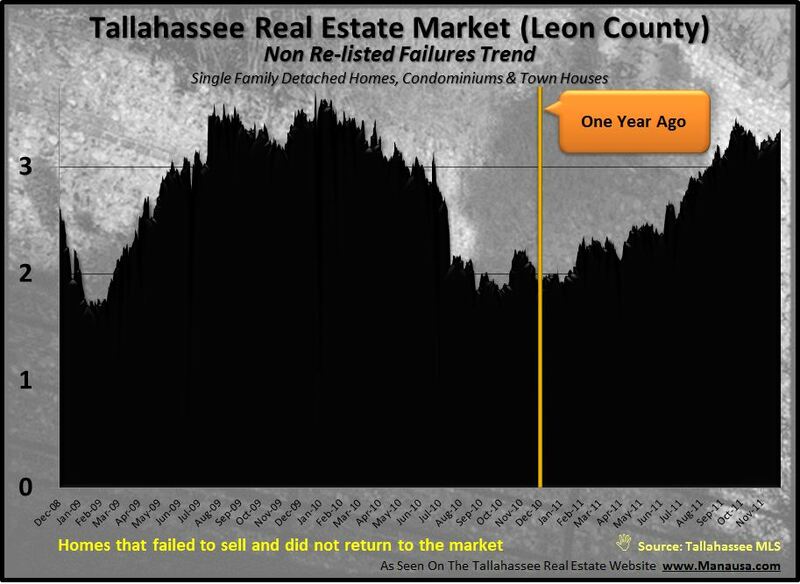 I will take a leap of optimism in my closing remarks to predict that a pseudo solution for home sellers will be available by 2013, as will the restoration of Tallahassee's traditional, steady population growth rate. The combination of these two factors will make it easy to see home sales double in 2013 and return to levels that are consistent with what happened in the past, prior to the housing market boom. Should my real estate forecast for 2013 be mostly right, we could expect to see excess home inventories consumed by the end of 2015 and home values could finally begin to stabilize. This means that my OPTIMISTIC outlook for home value stabilization is for 2015 or beyond. Please keep in mind this is as optimistic as I feel comfortable in forecasting, and government intervention and bank stalling could very easily make for a longer recovery beyond the 2012 real estate forecast. Amen George, why'd it have to stop :(. I'm hoping some of the mag-lab spin-off businesses can help with the higher-paying jobs, but overall, it's just going to take some time. First-I'm a retired Banker. I held every position from entry level to Pres.,CEO,and Chairman but I retired before the Industry got stupid. Let's use the term Lenders here because that is global and includes Commercial Banks, Finance Companies, S&L's,Credit Unions, etc. O.K. here it goes and I might be minus a few friends BUT we Lenders are a big,big part of the problem-past, present, and future. We had to one up each other to get the next deal. Programs like Stated Income, No Down Payment, 80/20, poor judgment LTV's, A-B-C paper. Lots of others contributed like cooperative Appraisers-if you shopped around you could get any value you wanted. Spec loans to Builders that couldn't carry if they couldn't sell it. Poorly managed construction loans. Banks went broke with concentrations of credit. There are billions to trillions of inventoried losses in real estate loans-most of the dollars in Commercial RE. Joe, you do a really good job with this. Notice I didn't offer any solutions-that'll cost you! Ah, you're such a tease Cliff. Surely you can throw out one or two ideas on the fix. Did you see my Short Sale Amnesty Program solution?